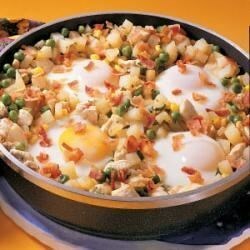 "'This recipe is one of my daughter's favorites,' relates Joyce Price of Whitefish, Ontario. 'To reduce cooking time and clean out the fridge, dice up leftover potatoes and use cooked chicken or ham instead,' she suggests." In a skillet, cook bacon until crisp. Remove with a slotted spoon to paper towels to drain. In the drippings, saute onion and garlic until tender Stir in the chicken, potatoes and oil. Cover and cook for 10 minutes or until the potatoes and chicken are tender, stirring once. Stir in peas, corn, parsley, salt and pepper. Make four wells in the hash; bread an egg into each well. Cover and cook over low heat for 8-10 minutes or until eggs are completely set. Sprinkle with bacon. My husband and I made this for supper last night. It was really good! We added it to our recipe book. We wanted to try something different. My fiance, my daughter and I all enjoyed this recipe. The only thing I left out was the parsely.